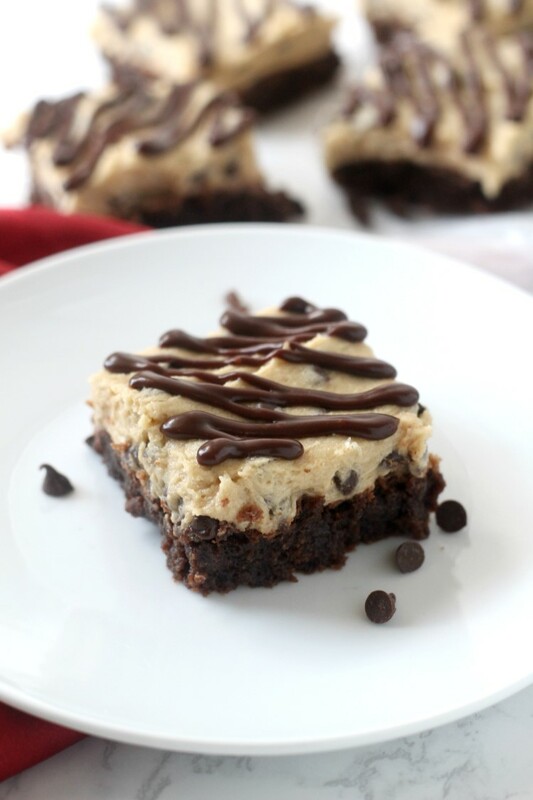 But these cookie dough brownies also rank up there as one of my all time favorites. I just can’t say no to brownies or chocolate chip cookies and here I get both. I’m a person who loves cookies, but is all over the dough first. Cookie dough is the best therapy for me. I don’t need fancy flavor profiles and gourmet ingredients, just give me a bowl and let me eat to my hearts content. I promise I’ll love you forever. A version of these cookie dough brownie has been around since I have been little. It was always a favorite at our house. However, I thought it could use a little improvement. I switched up the brownie base to my favorite fudgy brownies ever!! And then I added mini chocolate chips to the cookie dough. Somehow when we were little we never noticed the cookie dough didn’t have any chocolate chips. But now in my cookie dough connoisseur days, their absence is very apparent and easily remedied. I also swapped out a chocolate shell topping for a fudge drizzle. The only downside to making these is waiting for them to cool enough to spread on the dough and top chocolate layer on, and then waiting for that chocolate layer to set up. But they are oh-so amazing when they are done. Below is what the original looked like. If you want, you can melt a bag of chocolate chips with a couple tablespoons of oil and spread it over the cookie dough. But I like the fudge drizzle better. 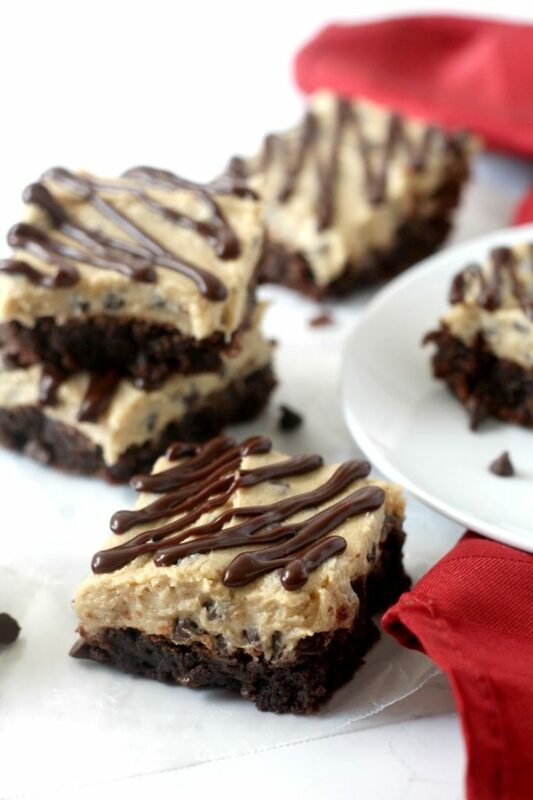 Brownies topped with a cookie dough layer and a more chocolate. To make the brownies, preheat oven to 350 F. Grease and flour a 9 x 13 inch pan. Melt the butter in a large microwave safe bowl. Whisk in the oil, sugar, eggs, vanilla extract. Beat in the cocoa, flour, salt and baking powder. Spread batter into prepared pan. Bake for 25-30 minutes or until an inserted toothpick comes out with a few crumbs. Let cool completely. In a medium mixing bowl, cream together the butter and sugar. Stir in milk alternately with the flour. Add the mini chocolate chips and stir until they are well distributed. Spread the cookie dough mixture on top of the brownies. Cover and place in the refrigerator. 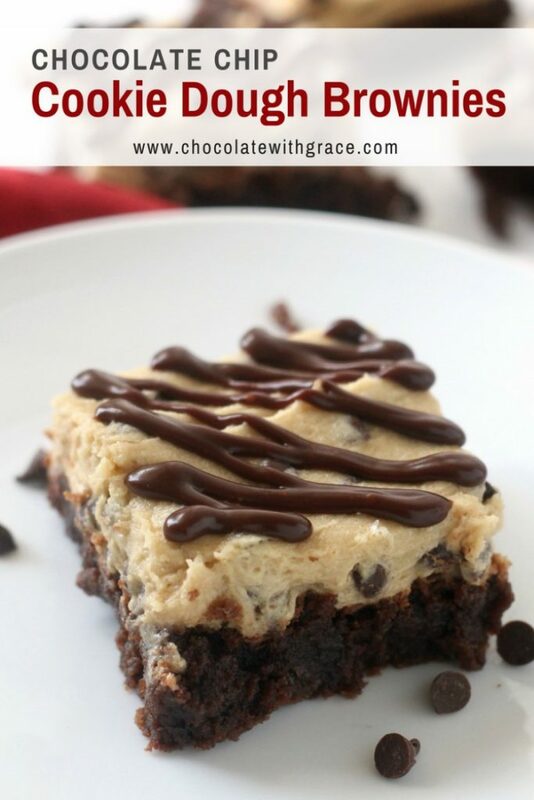 Do you love over the top brownie recipes? Try these other favorites from my blog. Mallory- just found your chocolate with grace blog and IG account…you are AMAZING!!! Wow! So talented! Love seeing your new ideas and posts, never knew you were such an awesome baker and photographer!!! Thanks, Lydia. I’ve been having so much fun with it. 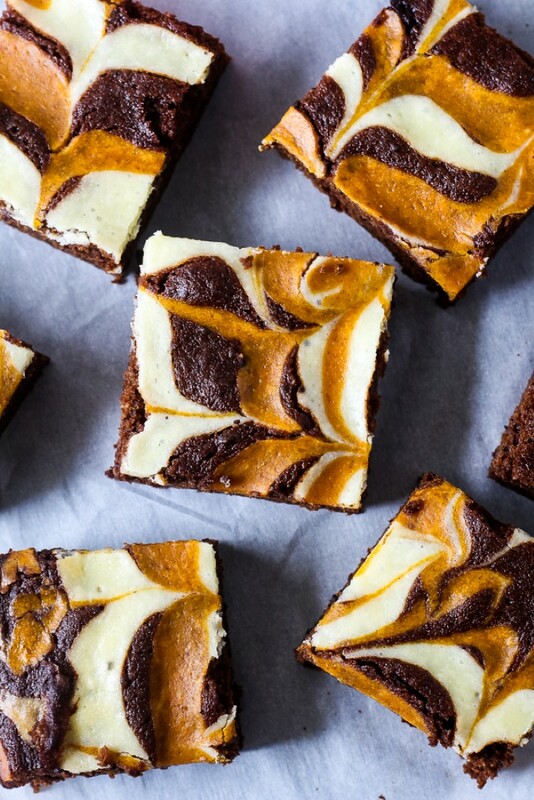 These brownies look incredible. I love the three layers. 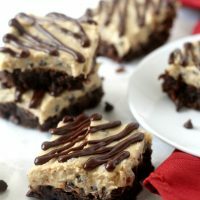 My MIL loves cookie dough and these would be perfect for her birthday! Perfection! I just love that thick chocolate later on top! 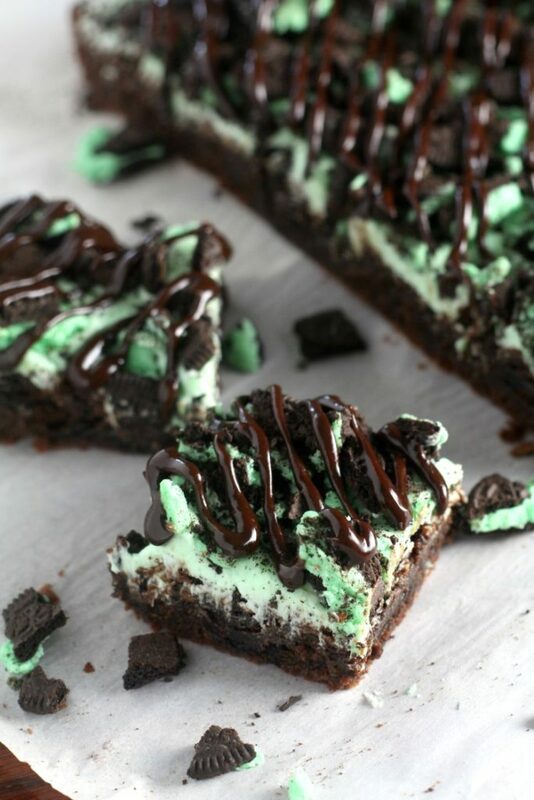 Love how rich and fudgy these look! Hi Mallory, I saw these on Foodgawker and Instagram, and just had to stop by and say that they caught my eye. They are beautiful, and so indulgent looking. I know what I’ll be making for my next dinner party! Really nice job. These are mouthwatering! Thanks for stopping by Nora. I hope you enjoy them. These would be worth the wait. The layers are gorgeous! 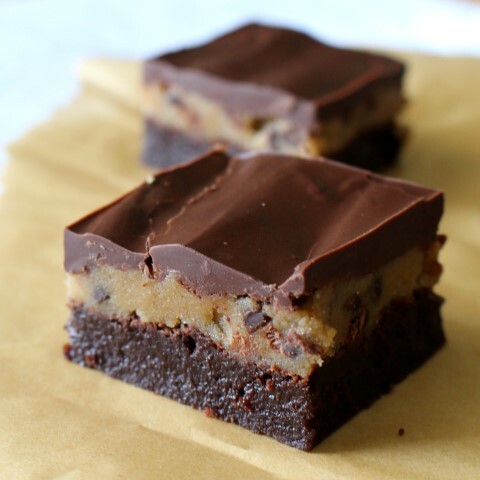 I like my bars thick and soft and fudgy and you got it all here AND added my favorite, cookie dough! Pinning! Great recipe Mallory! Thanks, Mary. They are definitely a treat! Wow! These look delightful! 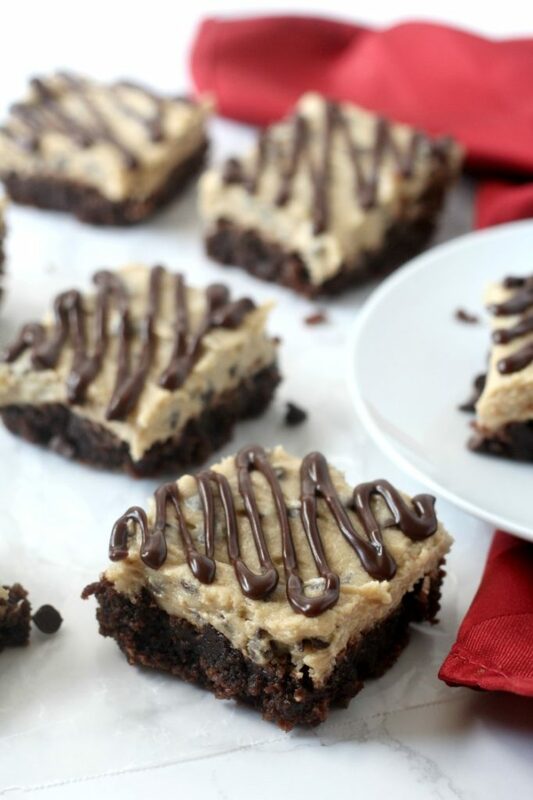 Cookie dough is definitely the best kind of therapy–and combined with brownies?! Insane. Love it! 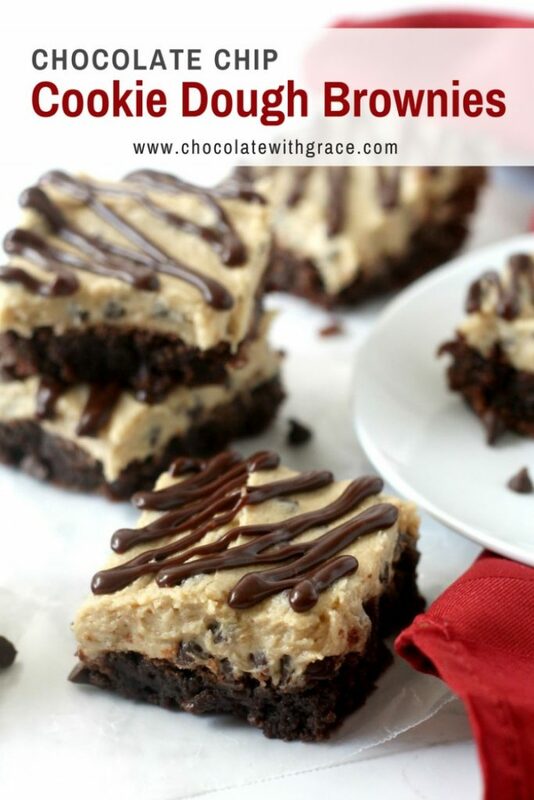 These brownies look so decadent and fabulous – pinning! Visiting from Project Parade link up. 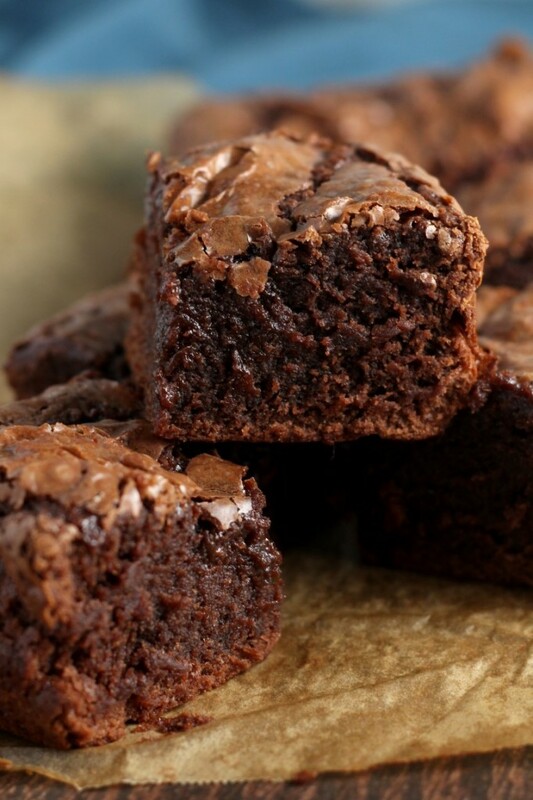 These brownies look amazing, I wish I could pick one of the screen, delicious! I co-host Sweet and Savoury Sunday and would love for you to stop by and share this and other recipes with us. Have a great day! Hi Mallory – Thanks so much for sharing with the Let’s Get Real party! Have a great day Mallory. Hi Olivia! Yes the “T” stands for tablespoon. I hope you enjoy. Very upsetting that this recipe appeared under an “eggless” search. There are eggs in the brownie.